A Green Heron at Five Rivers in Delmar, NY, was my trigger bird, so I was pleased the last time I was there to see one land on a nearby branch. I had never managed to get so close to a Green Heron in decent light before. I was actually at Five Rivers looking for butterflies, but who am I to turn down a brief photo session with the species that triggered all this birding? I watched and photographed for about two minutes until the heron flew across the pond for some hunting. 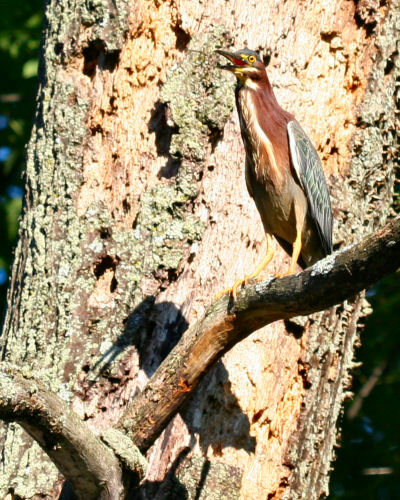 Green Herons breed every year at Five Rivers but they are usually not so confiding. Normally I watch them hunting frogs, small fish, and other aquatic life from a distance or hear their raucous squawks as I unknowingly flush them, so seeing one so close, in that certain slant of light, was wonderful. Maybe next time a Great Blue Heron will be so kind? Hi Corey — great photos. I’d say that was a very accommodating bird. I haven’t seen any green herons yet, but do hope to see a few before summer ends. Funny coincidence… I added this bird to my yard list yesterday. One flew over the retention pond behind the condos. @Patrick: Green Heron as a yard bird? That’s not fair! Sited green heron at Rt 66 State Park in Missouri just a few weeks ago, August 2008. 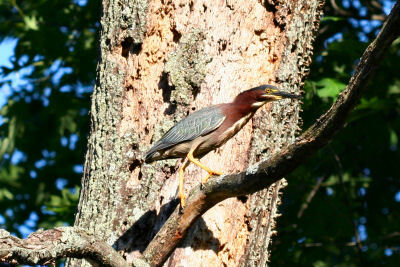 Spotted a green heron in Lincolnshire, IL (N.W. Chicago Suburb) at a retention pond near work. I was on awalking path when it swooped down about fifteen feet away from me out in the open, paced up and down the shore of the pond a bit then lunged forward and emerged with a small frog! I saw a blue heron catch and eat a fish at almost exactly the same spot from the same distance earlier this summer. rescued a green heron that had been hit by a car in the wildlife refuge on our way to the beach on fort morgan in gulf shores al.he was so beautiful! His leg was broken so we took him to the environmental center in mobile for rehab.we live on the bay and we see them often! I just had one come into my water gardens last Sunday July 12,2009. I raise water lilies and koi as a carried away hobby for the last 14 years. I am very partial to my koi and this bird has already eaten some young ones (that I have seen) but it is so photogenic and cool looking I dont want to run it off. I have bought some bait fish to feed it by my ponds, but it still ends up eating a koi. oh well I think I have a new pet, and have got some wonderful photos and movies of it in the last 3 days. Ill add some photos and or clips if I figure out how. I took about 20 photos of what I did not know was a Green Heron here in Dunedin Florida next to our condos. I am in a colored pencil class and did one from my photo of the Green Heron. Someone else in the class was doing one from a photo and that is how I found out what I had seen. MORE FUN! Life is a miricale! I had a bird that nested in my crabapple trees this summer. There were 5 birds that hatched. I am not sure what is was, but have some pictures of the babies as well as the mother sitting on the nest. I think I saw my first Green Heron yesterday in Mu Koh Ang Thon, National Marine Park in Thailand. 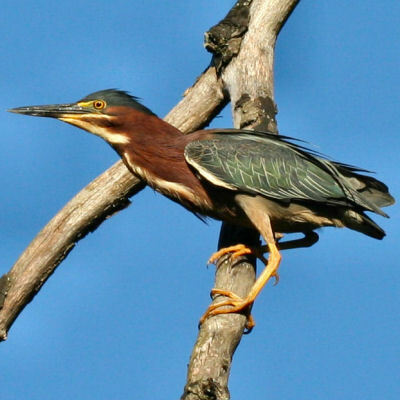 In my book of birds in Thailand, it is called Little Heron, in latin Butorides striatus. Is it the same bird? We also saw three Little Blue Herons. Next week we will go back to look for s Hornbill.